Hope everyone is having a great start to the week! I can’t believe July is almost over! The summer is seriously flying by, and while I’m sad to put away all of my summer brights, I’m excited to start incorporating more fall hues into my wardrobe. Dressing for transitioning seasons is one of my favorite things, because I love mixing and matching and making pieces that are for one season work for another! 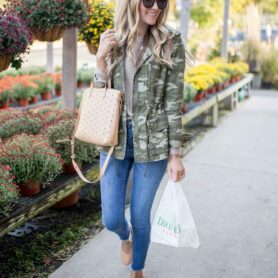 That’s why when I saw these studded slide on booties and this neutral crossbody, I immediately knew they would be perfect as casual seasonal staples. For me, the easiest way to start switching my wardrobe over for the fall season is by starting with shoes, especially since it stays super warm till about October now! Booties are my favorite way to go for this, and these adorable olive mules are such a great addition to wear now or later. Throw them on with some cut off shorts and a plaid button down for now, or wear them later with some jeans, a tee and vest. Not only are they cute, they are ridiculously comfortable and an easy way to dress up a casual outfit! Sole Society makes some of my favorite shoes for any season, and these are no exception. They come in three colors and are super affordable too! 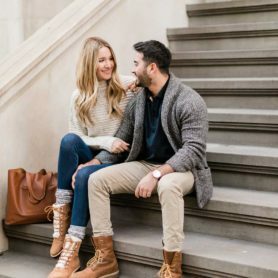 I paired them with some denim, a belt and an easy linen button down for a day of running around and then a date night! They were perfect since we had some rain this weekend and it cooled everything down. We headed to one of our favorite outside restaurants, and then picked up some ice cream to have at home with a movie. Pretty much the ideal weekend if you ask me! I’ve been carrying around this crossbody recently from Sole Society as well! I love being able to switch to a smaller purse, and this one is just the right size to fit everything you need. I was able to fit a water bottle, cosmetic pouch and wallet with room to spare! Today’s post is in partnership with Sole Society. All opinions are my own.